Film Makers are now running behind gritty and emotional real life tragedies, incidents and lives of people. Hollywood is front runner in it and bollywood is also proving its mettle in making them. Akshay Kumar came with such a real tale set in 1990, about one of India’s most awesome achievements — evacuating more than 1,10,000 citizens after Iraq invaded Kuwait in 1990 directed by Raja Krishna Menon. Lets see how it works on us. Super intelligent and tricky businessman Ranjt Katiyal (Akshay Kumar) lives in Kuwait with his most loving wife (Nimrat Kaur) and daughter. He is powerful and suave. Inspite of being an Indian, he always loves Kuwait and not India. He realizes his worth for his homeland only when the Iraqi soldiers invade Kuwait and all the Kuwaitis are forced to leave the country. He alone proves to be a huge helping hand in aiding 1.70 lakh Indians reach their homeland securely. How the whole mission is carried along forms the rest of the story. Akshay Kumar is fantabulous in his role and we cannot imagine anyone in his role. He looks suave.His performance as Ranjit Katyal is so utterly convincing that there are times in the film when he does not appear to be acting at all. Nimrat Kaur is so aptly perfect in her role and her performance in the scene where she puts a particularly obnoxious refugee camp inmate (Prakash Belawadi) is a proof of her well performed role. She is proving herself as a great actor with her performances in The Lunchbox then and Airlift now.Inaamulhaq as Saddam’s man-in-Kuwait, is suitably menacing, Prakash Belawadi as the annoying refugee really does make you want to slap him and is so pleasing, Kohli is kohl-eyed and restrained and makes us feel for him, Mishra as the Dilli babu, disinterested at first, then taking charge, fits right in. 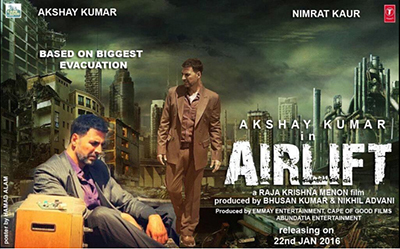 Dramatic background of the story is the main asset of Airlift. Screenplay of the movie makes you sit at the end of the seat and leaves you amazed and glues you to screen. It seems that a lot of entensive research have taken place while scripting.Scripting of the movie is perfect and dialogues are good. Except for climax, every bit is so perfect and gripping. Music by Amaal Mallik and Ankit Tiwari is so good that the songs garned so popularity among the audience with their release. Background score is perfect and creates the necessary impact.Cinematography by Priya Seth is so good and suits the mood of the film. Editing by Hemanthi Sarkar is perfect and nice. All the war scenes involved are composed well. Art direction is so convincing with its sets design. Production values are rich. Movie begins with very well composed war scenes with an edge of the seat screenplay packed with great performance of actors. The emotional connect showed in the movie is so natural and is so convincing. The movie seems to be made with a lot of extensive research. Director of the movie, Raja Krishna Mohan, has the perfect knack of showing this type of real incidents so well and engaging on screen. But, climax of the movie seems to be hurried and gets audience disappointed. Airlift is definitely one of the best and finest movies in Akshay Kumar’s career. 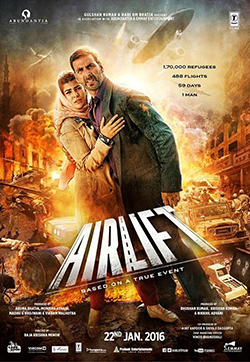 To conclude, Airlift is a gritty, emotional and well made movie which is a must watch for its super engaging screenplay.